Find a great sale price on this 2019 Audi S4 Premium Plus 3.0 TFSI quattro at Keyes Cars in CA. This 2019 Audi S4 is located at our State dealership in California. We serve the cities of Van Nuys, Valencia, Woodland Hills, Mission Hills, and Los Angeles. 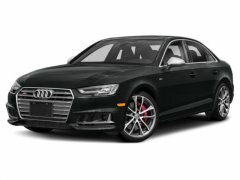 So if you're looking for a great price on this 2019 Audi S4 Premium Plus 3.0 TFSI quattro or just looking to get an auto loan for the vehicle you want... you've come to the right place! Keyes Cars. The 2019 Audi S4 isn’t just ahead of the curve. It’s beyond it. This luxury sport sedan isn’t one to wait around. The redesigned S4 — with its turbocharged 354hp TFSI engine that can accelerate 0 to 60 mph in 4.4 seconds, standard quattro all-wheel drive with available sport differential and cutting-edge technologies. 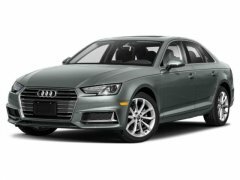 With sculptural horizontal lines and aluminum-optic double-blade bars, the Platinum Gray Singleframe grille is a distinctive statement on Audi design and the road, while iconic standard full LED headlights and taillights make every drive brilliant. Leather-wrapped and designed with shift paddles and the S badge, the three-spoke, flat-bottom multifunction sport steering wheel allows the driver to be squarely in command. The available tilting and sliding panoramic sunroof offers both the front and rear passengers a virtually unobstructed overhead view while flooding the cabin with natural light. The awesome power of the S4 helps prove this luxury sport sedan is not for the faint of heart. The standard drive select system has four distinct driving modes, so you can modify various vehicle performance characteristics to help tailor your S4 to suit your driving style. The S4 offers a range of convenient features including a fully digital 12.3in information cluster, navigation, phone integration, head-up display, advanced key with keyless start, stop and entry and a premium sound system. You’ll also find a comprehensive suite of safety features such as side assist, pre-sense technology, active lane assist, traffic jam assist, parking system plus, adaptive cruise control, traffic sign recognition, collision avoidance assist and turn assist.